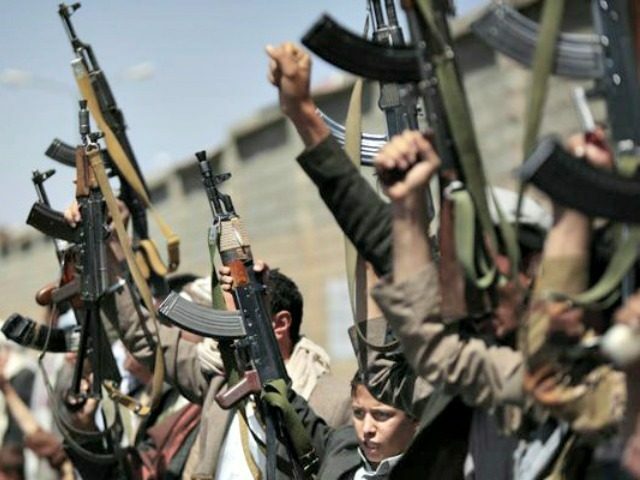 A report in Saudi outlet Al Arabiya on Monday cites local sources in Yemen as claiming that internal strife among the nation’s Iran-backed Houthi rebels has claimed the lives of more than 30 fighters who attempted to desert the movement. The dozens of men involved in the incident reportedly attempted to surrender to the legitimate government of Yemen under President Abdrabbuh Mansur Hadi. Before they could, however, their Houthi superiors reportedly caught up to them and executed them for desertion. Al Arabiya’s source “added that some were executed by small arms, and others by RPGs, after refusing to stand in the frontlines against the Yemeni army, and attempting to surrender.” The report notes, additionally, that the Houthis are “losing a lot of fighters” in battle as well as through attempts to flee. A struggle between Hadi and the Shiite Houthi rebels, who later joined forces with former President Ali Abdullah Saleh before killing him this month, has expanded into a proxy war between the Houthi’s patron state Iran and Hadi’s Sunni allies in Saudi Arabia. The desertion report comes from a Saudi outlet; the Houthis have yet to confirm it. The report could be an indication of simmering tensions within the Houthi ranks, however, hinted at in reports shortly before Saleh’s killing. In early December, the Associated Press noted in an on-location report that Houthi fighters had begun attacking Saleh loyalists with whom they once formed a united front against Hadi and the Saudi coalition. “Pictures of angry Yemenis tearing down posters of the Houthi leader, Abdul-Malik a-Houthi, in Sanaa flooded social media as street fighting there appeared to split the capital in two, with northern areas under Houthi control and southern ones under Saleh’s fighters,” the AP reported on December 4. The report noted that Saleh’s supporters and the Houthis had long been enemies and united only in their opposition to Hadi. Last month, however, some leaders began to call for Saleh’s supporters to unite against the Houthis, and Saleh himself called for his supporters to “turn a new page” and unite with the Saudi coalition. Houthi leaders killed him days later, asserting that he was “the leader of treachery” and died alongside some of his closest loyalists. The Houthis control the Yemeni capital, Sana’a, while Hadi and the legitimate government operate out of the port city of Aden. The Houthi slogan reads, “God is the Greatest, Death to America, Death to Israel, Curse the Jews, Victory to Islam.” They have since issued a “sincere apology” to America for the slogan. On Monday, PressTV condemned Saudi Arabia for alleged attacks on “civilian targets” in Yemen. The intensified bombardment of residential areas, the continued blockade and closure of maritime, ground, and air entry points, and the denial of access to humanitarian aid and basic needs by Saudi rulers indicate their desperation, defeat and countless failures in achieving their goals through aggression on Yemen. Iran is facing its own charges of exacerbating the growing humanitarian crisis in Yemen. Last week, American Ambassador to the U.N. Nikki Haley presented evidence that the Houthis were using Iranian weapons to attack Saudi targets. Downed missiles launched into Saudi Arabia by Houthi fighters reportedly featured parts manufactured in Iran, making the possibility that the Houthis procured the weapons without Iranian help unlikely.